Following some feedback on Facebook, we decided to look at a request for a meat and two veg dish, so we decided to create a popular dish with a bit of a difference for tonights dinner. This meal is cheap and easy to make and perfect for winter weather. 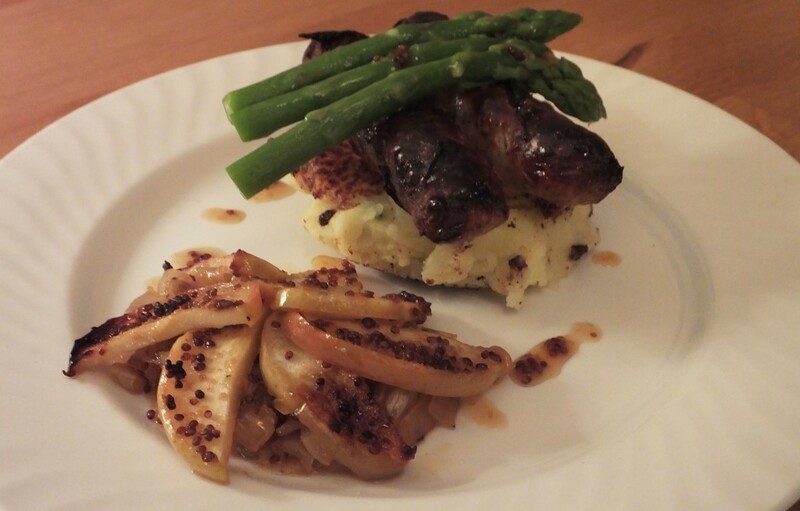 This is our twist on one of Britain and Ireland’s most popular dishes – Bangers and Mash. The cider and honey in this recipe will create a beautifully caramelised and sticky apple and onion glaze for the oven roasted sausages. The addition of a champ potato rosti provides and added textural element, while still maintaining that wonderful buttery champ taste that we all love. Before you begin, pre-heat your oven to 200C. Slice the onions and put them in a roasting tray and splash with 2 tablespoons of water. Cover this with foil and roast in the oven for 45 – 60 minutes. Put your cider in a saucepan with the honey and wholegrain mustard. Bring this to the boil and then reduce the heat and allow to simmer until the liquid has reduced by half. While the onions are roasting, core the apple and slice thinly. 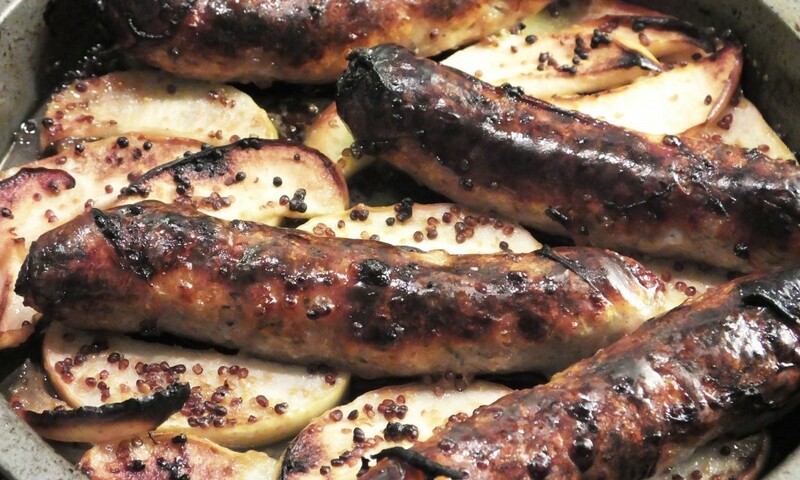 Arrange the apple slices onto the base of a baking tray and place the sausages on top. Make sure you prick the sausages to stop them from bursting. 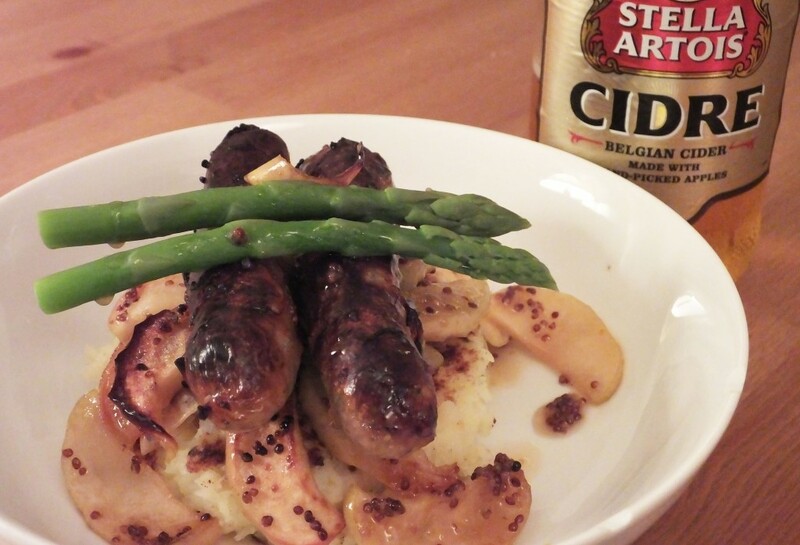 Spoon half of the cider reduction over the sausage and apple combo. Place the tray in the oven and bake for 20 – 30 minutes, turning the sausages halfway through and spoon over some more of the cider reduction. Pour the remaining cider reduction over the onions and allow them to finish roasting. While your sausages are in the oven, peel and quarter the potatoes and add them to a pot of boiling water. Cook until a fork easily goes through them; this should only take about 10 minutes. Once the potatoes are cooked, drain them and return to the pot. Mash the potatoes and add the knob of butter, milk and sliced spring onions. Stir well together and season to taste. Heat a frying pan and separate the champ into 4 portions. Spoon each portion onto the hot frying pan in separate piles, and flatten lightly with a fish slice. After 2 – 3 minutes carefully turn each rosti over and cook for a further 2 – 3 minutes until both sides are golden. Rinse your asparagus and break off the base of the stem by hand. This removes any woody part in the asparagus. Add the asparagus to boiling water and allow to simmer for 2 – 3 minutes so that they still have a slight crunch. Drain and toss in butter before serving. Place the rosti on the base of your plate and top with some of the sticky, caramelised onions. Fan the apple slices into a flower shape and arrange on top of the onions. Position 2 sausages on top and garnish with asparagus. Drizzle some of the cider reduction glaze that will be in the baking tray that the apple and sausages were cooked in. Serve up with an ice cold glass of the remaining cider. No point in it going to waste.